Assumed to be broadly similar to living elephants; evidence of living in herds and all male groups. Also, evidence of adults protecting young. Opportunistic grazing and browsing. Evidence of plants and fruits, including grasses, pondweed, raspberries, oak, and cactus. Adult mammoths: No predators other than human hunters living more than 13,000 years ago. Calves may have stayed with mothers for 5-6 years or more. In one study, a male's reproductive period may have approached 10-13 years of age. 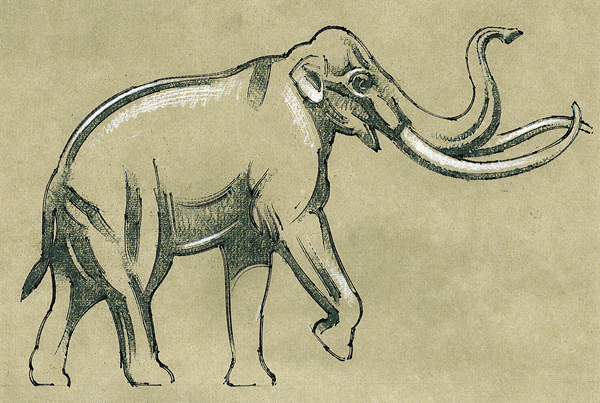 The Channel Island (or Dwarf) Mammoth was less than half the size of Columbian mammoth. 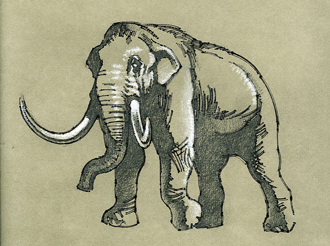 It was the smallest mammoth−similar to other species today, where an island species is substantially smaller than its mainland counterparts.